Cartoonist Leslie Chew has been arrested for two cartoon posts under his "Demon-cratic Singapore" series. (Facebook screengrab) . Singapore police arrested Mr Leslie Chew, 37, the person behind the cartoon strip, Demon-cratic Singapore, on Friday morning, for alleged sedition. He was held in custody and questioned over the weekend, and was released at 8.45pm on Sunday after posting bail of S$10,000. The police confiscated his handphone, computer and hard disk. He was also asked to surrender his passport to the police at the Cantonment Police complex. The charges relate to two of the comic strips on his Demon-cratic Facebook page. Mr Chew has produced more than 600 cartoons thus far, including those on the page. The two in question are this one and this one. The first cartoon, published on his Facebook page on 14 December last year, and titled “Demon-cratic Singapore Episode #438, Eliminating the thorn first...”, had also been the subject of a letter of demand from the Attorney General Chambers (AGC) last year. The AGC, in a letter to Mr Chew on 17 December, said the cartoon “scandalises our Courts through allegations and imputations that are scurrilous and false." However, it said it would not commence further legal proceedings against Chew if he posted an apology on the page, removed the cartoon and “all accompanying comments” related to the post, which has gathered over 600 likes, shares and comments since December. Chew, however, decided not to comply because he said his work is fictional, and not related to any real events or persons, as stated on his Facebook page. On its page, which has 19,000 likes, Demon-cratic Singapore describes itself as a "100% fictional comic series about a country that does not exist". Under Singapore's Sedition Act, among other things, it is an offence to bring into hatred or contempt or to excite disaffection against the Government; and to promote feelings of ill-will and hostility between different races or classes of the population of Singapore. Anyone found guilty of the offence can be fined up to S$5,000 or jailed up to three years, or both. Chew, however, denies any such intentions, again pointing to the disclaimer in each of his cartoons which says that the portrayals in them “are purely fictional”. “I also explicitly stated that Demon-cratic Singapore is an entirely imaginary country and is not the Republic of Singapore,” Mr Chew says, referring to this page. The latest arrest follows a spate of legal action by members of the Government against online commentators and sites. In January, Prime Minister Lee Hsien Loong demanded writer and activist, Alex Au removed his blog posts about Action Information Management, the PAP-owned company embroiled in the controversy over the PAP-run town councils’ computer system. And on 18 April, the AGC demanded an apology and the removal of posts from several websites which it alleged cast doubt on the judiciary's integrity. Chew, who says that the police was “very professional” in the way they treated him, has been asked to report to the police on 30 April. 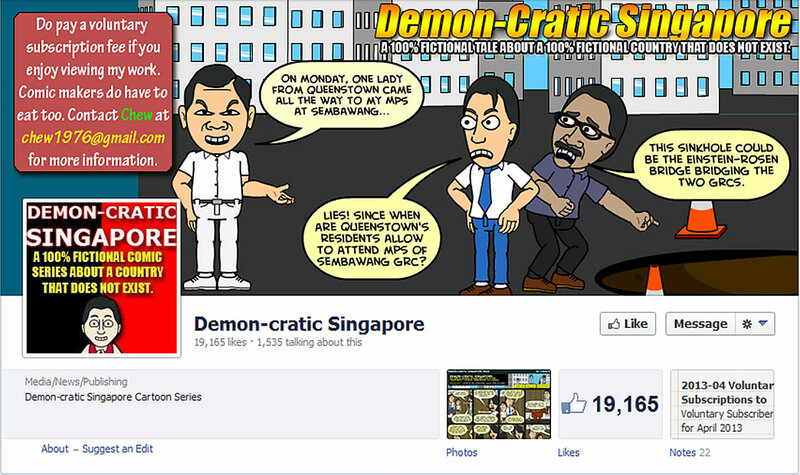 “Most fans know that Demon-cratic Singapore is fictional and are just for laughs,” said Chew. “Even when there are new readers who thought otherwise, they are usually quickly reminded by other readers that everything on my Facebook page is fictional."